A decorative technique produced by scratching the surface of a painting, pottery, or glass to reveal a different color layer underneath. Sgraffito was used during the Middle Ages on illuminated manuscripts. 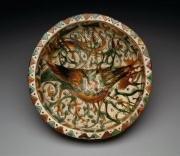 Sgraffito decorated pottery, or sgraffito ware, include 12th century Islamic pieces, 15th century Japanese celadon ceramics (punch'ong), and 18th century English blue class stoneware. Encyclopedia Britannica, http://www.britannica.com Comment: "sgraffito." Encyclopædia Britannica. 2005. Encyclopædia Britannica Premium Service 4 Feb. 2005 . This page was last edited on 10 May 2016, at 12:10.